When I was in college, recipe my favorite snack was soda crackers slathered in yellow mustard and a Diet Coke. Soda crackers and mustard? Isn’t that a bit…weird? Probably. But I loved how the crunchy blandness of the crackers contrasted with the salty, vinegary mustard. I could eat them all day. These days, I’ve moved on to more sensible and refined snacks like salted chocolate covered graham crackers or homemade power bars, but I haven’t lost my deep-rooter affection for mustard. Especially for grainy, spicy mustard. The kind with a little bit of a kick. This mustard is just that. I used some Guinness to add a bit of malty flavor and some honey to sweeten it up. It will be the perfect compliment to the roast beef and pepper jack sandwiches I’m making tonight. By the way, if you’re thinking, She’s crazy. Why would I make my own mustard? The answer is: because it’s easy. Just combine the ingredients, let them sit and blend. Voila! Mustard. The best part is that you can adjust the vinegar and honey to get it just the way you like it. There are many different kinds of mustard seeds – yellow, brown and even black. All mustard seeds are different. Some are spicier than others, so you might have to buy from a few different sources until you find your favorite. Place all of the ingredients in a non-metallic bowl. Metal bowls might react with the vinegar in not so tasty ways. Mix everything together and let it sit covered or uncovered for about an hour. Place everything in a blender and pulse until your mustard reaches the desired graininess level. You can either use your mustard right away and it will have a little bit more “kick” or you can refrigerate it overnight for a mellower taste. Mustard will keep in the fridge for a very long while, but I would use it up within a few weeks if possible. Makes about 1 1/2 cups mustard. Guinness mustard ? I know this is going to taste incredible before I even make it this looks fantastic. I shall pack my camels cross the dessert and present Guinness mustard before my king..
Ha – I’m 36 and I still live on Diet Mt. Dew and Coke Zero. In college I lived on Tab. I drank it for breakfast, too–sometimes six glasses (drinks were unlimited in the cafeteria). My dorm room was right across the hall from the bathroom. My bladder didn’t recover until after I gave birth to my first child. I’m planning to make the mustard–thanks for the recipe. love the glass container in the photo, just wondering what the brand is? 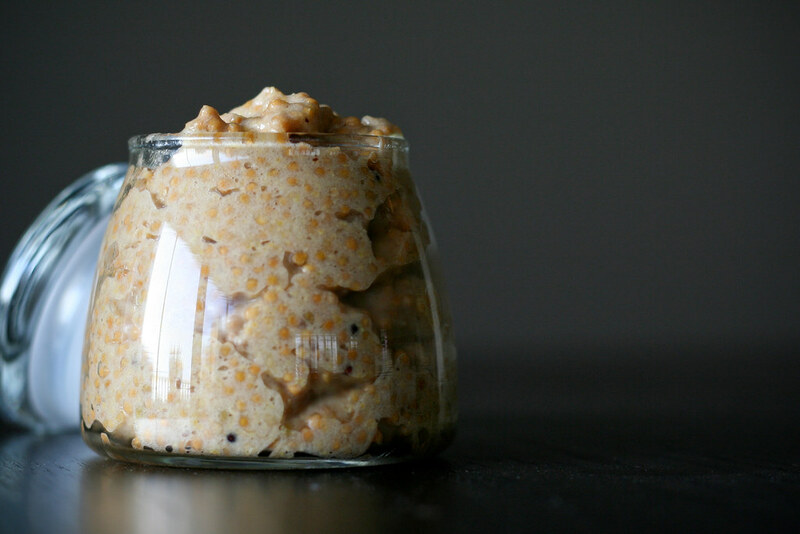 I made cognac mustard years ago (from my own homegrown mustard seed… not so easy!) and loved it.. Guinness mustard sounds amazing… and so easy! Loved your mustard and soda cracker confession! I love mustard and look for ways to make my own – this sounds really good ! Would you believe that I just bought a bag of yellow mustard seed day before thinking I would make my own mustard…and here you are! Hvnt any stout though. Would it still work? No harm trying I guess! I would like to share a similar method that I use frequently. It may be slightly more convenient since it does not require a blender and clean up thereof. Beer – to proper consistency. – Is important to let it sit around for an hour or so to develop flavor. Use caution – this will blow your hat off. I just found this site a while back when a good friend suggested it to me. I’ve been a regular reader ever since. Nice recipe. A question: is the mustard seed by volume or by weight? I am assuming volume since everything else it too. Is that correct? Thanks, and keep up the great work.